Researchers from the Swiss institute of technology École Polytechnique Fédérale de Lausanne (EPFL) have developed a revolutionary contact lens with telescopic properties. When combined with an accessory pair of glasses, the contact lens can magnify objects by 2.8x normal vision. Using winks, the wearer can switch the glasses between normal and magnified views, a capability that holds great promise for patients suffering from age-related macular degeneration (AMD) and other diseases causing vision loss. AMD is a leading cause of vision loss. The disease affects hundreds of millions of people worldwide and has a significant impact as visual acuity gradually degenerates. In some cases, telescopic glasses are used by patients to help mitigate shortcomings in vision. However, these glasses are bulky and limit social interaction. Plus, they can’t track eye movement, meaning the patient must reposition their eyes and tilt their head when using them. To provide a more functional and socially acceptable solution, the EPFL researchers have developed a telescopic contact lens, according to a recent press release. 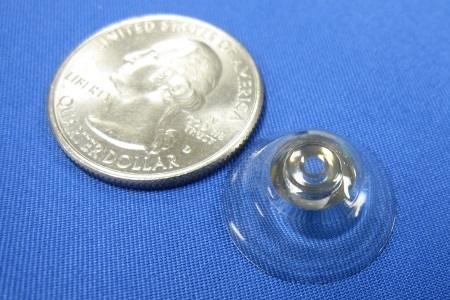 The contact lens is only 1.55 millimeters thick and includes a thin reflective telescope as part of its construction, according to the press release. By redirecting the light inside the lens with reflective surfaces, objects appear larger — as if seen through low-power binoculars. The initial design was first released in 2013, according to a previous story. Since then, the team has been refining the design and developing accessories that complement its function. The latest addition to the system is a pair of smart glasses that are designed to help make the system more usable in everyday life. The glasses are polarized and, through an on-demand electronic switching function, can cycle back and forth between normal vision and magnification of 2.8 times normal. Switching back and forth is facilitated by winks from the user, which the glasses can distinguish from normal blinks. Winking the right eye leads to magnification, while winking the left eye provides normal vision. The contact lens is based on rigid scleral lenses that have a larger diameter than typical contact lenses. While these lenses have found use in certain applications, wearing them long-term requires a breathability that these typically impermeable lenses don’t allow. To improve this shortcoming, the EPFL team has incorporated 0.1-mm-wide air channels, which allow oxygen to pass through and around the lens. Providing solutions to offset vision loss is one approach to dealing with AMD clinically. Another is treating the condition before vision loss progresses. One promising technique that was recently introduced is the use of low-energy, high-speed laser treatment of the macula, as described in a recent article.